Yes, it’s bold to claim that the Archer 2™ has the best battery in the industry. But we’re going to make it because we truly believe it. From our customer research prior to designing the Archer 2, we found that having a long battery life was of the utmost importance to our customers, second only to having excellent display visibility in sunlight. Our research shed light on the fact that the possibility of a dead battery during working hours is a huge concern for customers, whose productivity depends on a functioning data collector. Many expressed that they needed a device that could run for at least 10-12 hours, in order to accommodate for the occasional overly-long workday. We took this enlightening research to heart, and focused on finding a solution to this problem and implementing it in the Archer 2. The result? Bring in the Overtime Technology™ battery. This bad boy will run the Archer 2 long past the 10-12 hour minimum, and even over 20 hours. And it doesn’t need the display dimmed down to 10% and idle mode activated to do so. These runtimes come from testing the Archer 2 while simultaneously running functions like GPS, Bluetooth®, Wi-Fi®, camera, and connected accessories. 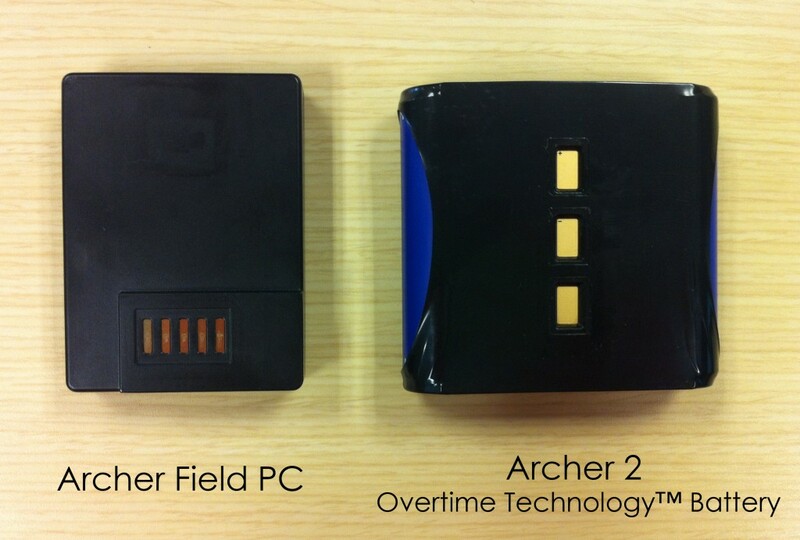 Even next to the original Archer Field PC’s battery, the Archer 2’s battery is larger and contains more power. The Archer 2 has undergone extensive testing in a plethora of different work scenarios to observe how the battery would perform. For example, a land surveyor may need the GPS receiver and Bluetooth running the entire day, while a water quality specialist might need additional display brightness and the extra power to run an attached accessory. Total Runtime: 15 hours, 45 minutes! Total Runtime: 23 hours, 15 minutes!!! No GPS, no Wi-Fi, no Bluetooth, and backlight at 70%, it will run 14 hrs. GPS enabled, no Wi-Fi, no Bluetooth, and backlight at 70%, it will run 8 hrs. The above runtime difference between the Archer 2’s battery and competitors would be even more substantial in cold temperatures. The Overtime Technology™ battery incorporates special technology used in hybrid car batteries, which reduces excess battery drainage in cold temperatures, which can be significant. To give you an idea, at -30° C the Archer 2’s battery can run 62% longer than the batteries which most other rugged handhelds use! The Overtime Technology™ battery has an incredible charge cycle rating, which is a measure of how well it holds a charge over time. A typical battery is rated to 300 cycles—or the number of times it is charged and depleted—at which point the battery can only retain 75% of its original capacity. The Archer 2’s battery is rated to well over 1000 cycles! 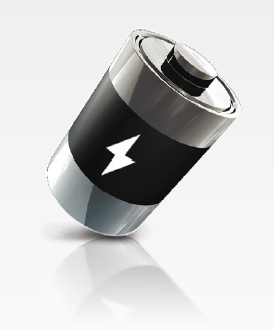 Most batteries’ capacity drops off sharply, necessitating its replacement within 1 – 2 years. We intend for users to not need to replace the Archer 2’s battery over the entire life of the handheld. In order to further expand the Archer 2 battery’s benefit to users, we also added a quick-charge capability. This enables a user to charge the battery in their car during lunch or while on break, and receive significant power in a short amount of time. With a mere ~45 minutes of charge time, the Archer 2’s battery can be charged up to 70% capacity! These features eliminate the need to carry multiple battery packs to make it through a long work day. Our hope is that the Overtime Technology™ battery will alleviate users’ concerns about battery life, and they will be better able to focus on the task at hand. Want to learn more about the Archer 2? Contact Juniper Systems today. Or, ask a question below in the comments. Hello, I work in the Arctic and manage the use of the Mesa Rugged to 2 dozen participants. My question to you is, why doe’s the batteries have no capacity to charge in temperatures below 0 degrees Celsius?. There is no problem operating the Mesa (and hopefully Archer 2 soon) in very cold temps, down to minus -40; but charging the battery in freezing temperatures is not available. Hi Joe, thanks for your comment. The reason that batteries are unable to charge in excessively cold temperatures is because at that low temperature, the chemicals inside the battery are unable to function. The battery in the Archer 2 is able to charge at 10 degrees lower than the Mesa batteries can. However, the issues with charging at very cold temperatures is widespread among batteries everywhere. People are only now theorizing ways in which to enable batteries to charge at excessively low temperatures, so this is something that is experimental and unknown for the time being. Your best bet is to charge the batteries at or above freezing point. that’s helpful information. the 10 degree differential will be substantial for our use.